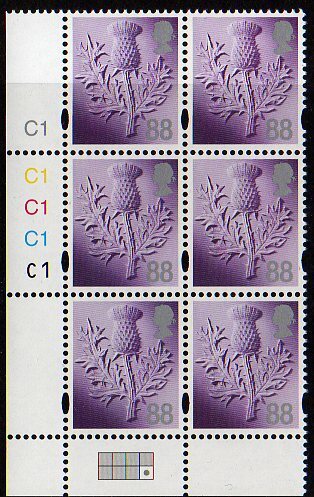 Scotland 88p country definitive stamp - new cylinders, or just redrawn numbers? The postage rate increase in the spring required new country definitives, as well as Machins. 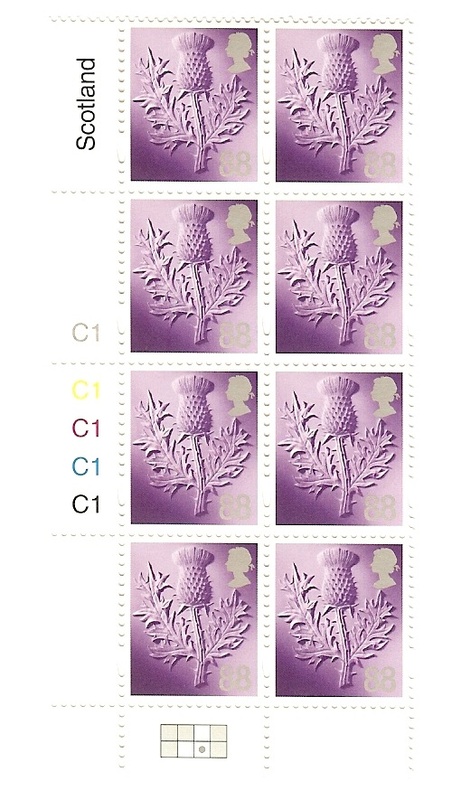 The Scotland 88p was printed on 14/01/13 with cylinders C1 phosphor, silver, yellow, magenta, cyan and black. Unusually the black had a different font, with a narrower 'C' and with the figure 1 pointing down, rather than ending horizontally as on the other colours. Close examination of the phosphor cylinder number shows that to be the same as the black, but the phosphor 'C' is of a third type, being similar to the colours but with the two ends truncated and pointing only slightly down and up, ie ending almost horizontal. This is impossible to show in an ordinary scan. With the fonts available on this blog, the black C and 1 are similar to Arial, the phosphor C is closer to Verdana. What you see, of course, may depend on your browser settings. Thanks to AM we can show the cylinder block from the 31/05/13 printing. This scan shows that the black is the same as the other colours, but also the grid layout has changed, with the Scotland 88p now in positions 3, 6 and 7 instead of just in position 8! But this begs the question, do cylinder numbers really mean anything now, to Royal Mail or the printers? Why were the cylinders not changed to C2? Ian, I suppose it is only the Printers who can tell us what value Cylinder numbers have today. It may be that the 'printer' has an instant check to show that the correct inks have been applied in the process, If you take the Scotland stamps shown, would it be obvious if one of the inks had been omitted just looking at the stamp? Colour check dots could serve that purpose. The point of cylinder numbers is that they should change when a new cylinder is used to print the same image, ie the earlier one is no longer usable for some reason. These days most cylinder replacements seem to be with another version of cylinder 1, though there are exceptions (eg the low value definitives). Any news on Cartor reprints for the 1st & 2nd class Northern Ireland stamps?